The site was given as a free gift by Mrs Gibson of Sandhurst Lodge and Mr A.W.Blomfield was appointed as the Architect. The foundation Stone was laid on 27 September 1872 and only 8 months later there was a great gathering for the Consecration of the new Church by the Bishop of Oxford, Dr J Mackarness, on 5 May 1873. The church was built only as far as the Chancel (the arch where the green carpet starts) until further funds could be raised. This was done with enthusiasm and the Chancel, the Lady Chapel, Organ Chamber and Vicar's Vestry were all completed in 1889. The lovely Victorian East Window was put in place in 1894 - the original Chancel Screen was added in 1899 and the Choir Vestry was built on nine years later in 1908. 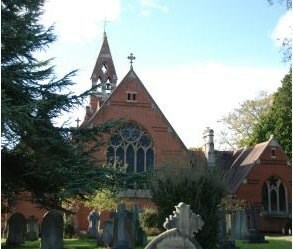 Outside the Church, the Lych Gate was added in 1913 and was later converted into a War Memorial to the men of Crowthorne who lost their lives in the 1914 -18 War and the Churchyard Cross was erected in 1914. If anybody would like to expand to this series please do, I would just ask that you could let sadexploration know first so he can keep track of the Church numbers and names to avoid duplication.